Scrap polymer clay isn’t always what it appears to be. Today I’m going to show you how there’s really no such thing as scrap clay in my world. 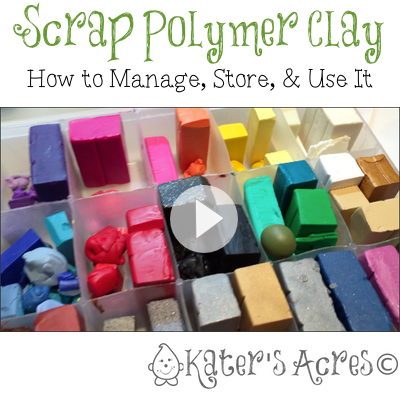 Scrap polymer clay isn’t always what you think it is … If you have worked with polymer clay for any length of time, you already know that you will generate a LOT of scrap polymer clay. Having a system that works for you on storing your scrap clay will ensure that you can use all of it and will actually have very little scrap clay. In my tutorials here on the website and also for Parker’s Clayful Tutorial Club, you will see I use a lot of “scrap blue” or “scrap green” for projects. For those of you who have wondered what I meant, here’s a brief little video for you on how I store my scrap clay. There are a fair amount of articles on the site on how you can store your clay. I have store my clay in this same embroidery floss box for 7 years now and it’s still holding on strong! Honestly, I don’t seeing myself switching my open clay storage system any time soon. This system works for me. This video today is just a brief little explanation of how/why I store my open clay like I do. Hopefully those of you who do belong to the club will better understand why I grab a hunk of this and a hunk of that, throw it all together and BAM – this is whatcha get! Hopefully this video will inspire you to come up with your own storage system for polymer clay so you too can reuse as much scrap polymer clay as possible. It’s such a shame when I watch clayers throw perfectly usable scrap clay into the “mud” bin. I always feel bad. This little embroidery floss box keeps me from doing that! Reusing clay scraps & pieces ensures that you have very LITTLE wasted clay! Please excuse my voice in this video as I have a cold! Sometimes the answer isn’t your hands but rather the clay. There are some very SOFT clays out there and some harder clays. If you are using a notoriously soft brand of clay (like Sculpey III), try switching to a firmer brand like Premo! by Sculpey. Sometimes just the change of brand will make a huge difference! Hi Reesa, I’m not sure where you got this information from but that it NOT correct. Polymer clay does not dry out. It does NOT need stored in baggies. Polymer clay stays soft until it is cured (oven set). Clay softener is used on clay that has lost some of its plasticizers over time. I have bars of Prosculpt that I purchased a couple years ago and set aside and forgot about. I recently tried to use it and it was hard as a rock and instead of softening, it crumbled into tiny pieces. Is that a different formula than the clay you are talking about? Prosculpt is a polymer clay, but that’s not what I’m talking about in this video. Although I do have a couple articles on how to soften rock hard clay. When sorting this way won’t the separate pieces eventually start bonding to each other? That is what I heard and that even sorting pieces of same colors will eventually bond and ruin clay. I am a beginner with polymer clay and I really don’t want to ruin my investment. I’m not sure what you mean by “bonding to each other.” The clay will stick to each other a little bit, but not enough to change the color. Plus you can always slice those tiny pieces apart. That’s why I keep each color separate (i.e. : no white with black). And the colors touching each other will by no means ruin the clay. Wow, I though all clay had to be wrapped up tight in saran wrap or some such thing or it dried out. This is such an easy way to store it. Thanks! I’ve learned something already and haven’t even really started! Not at all Lee. Air dry clay or paper clay does have to be wrapped up tight as can be … but not polymer clay!